Occasionally, when I’m in a masochistic mood, I like to daydream about first-gen Dodge Vipers. You don’t see that many of them and they are so hilariously bad that they are actually amazing. 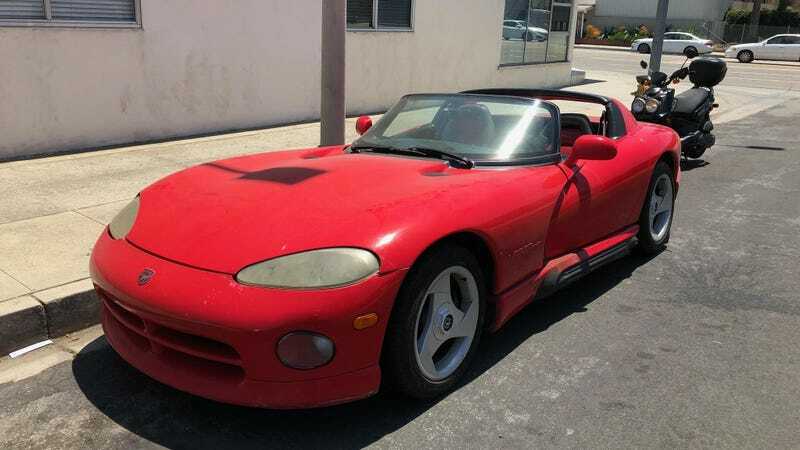 This red one I’m showing you now is the grossest, grimiest, most disgusting example of an early Viper that I’ve ever seen. And that is what makes it perfect. This Viper and its owner live near Jalopnik friend Matt Farah on the westside of Los Angeles. He sees it every so often, but this time he found it parked and managed to get some photos of it. He told me once that it was dirty and bad, but I didn’t know it was this dirty and bad. How does any light even shine through those fogged headlights? Incredibly lackluster paint. And just look at that crooked bumper! At least the seat covers are new. But, there, in the passenger seat... is that... trash? Why? Why would you do this? And here: Some kind of attempt at touch-up paint? But applied with a massive brush? What is going on? Farah said that the Viper has 191,000 miles on its odometer. I would be willing to bet that 190,000 of those miles have been burnouts. Raph thinks the car has averaged 22 mph in its lifespan. But its rear tires? 122 mph. God bless whoever owns this car. It is a love, a life, a prince. Maybe one day, it will be my prince.